After a slow start where the Dragons threw everything at us, we turned in a power display in the second half to dominate the game. 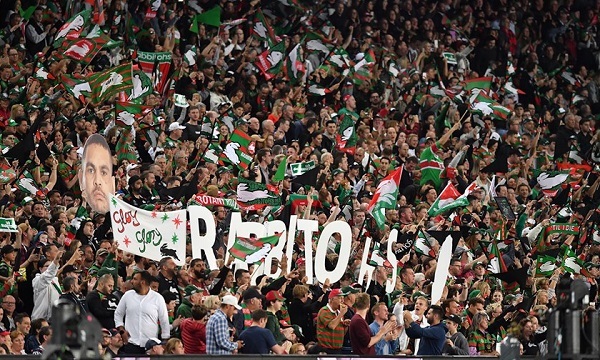 Souths forwards once again laid the platform. 2 from 2 is a great start but now for some work to do and as injuries and suspensions are starting to mount up, with GI and Tracey added to our injured list and Knight out suspended. It will be a test of depth this weekend with all 6 grades playing. Still 12 more wins to qualify for the semis. The evolution of Sam Burgess this year has been of interest. Bennett has chosen to have him start on the right edge in the second row. Where he plays for around 35 minutes, before reverting back into lock or prop. It has been evident that Sam is fresher in the second half as he dominated the forwards later in the game and set the platform for our second half revival. It was a very tight contest in reserve grade this week. In the trials the team copped a hammering only a few weeks ago, so to see the new commitment when the main NRL squad members returned was refreshing. But once again the team was just behind on the score board heading into the final minutes. It was a short kick 35m out from Johns with Allan following through that won the game this week. They had tried a similar move a few minutes before but luckily the second attempt was a success as the boys stole the match two weeks in a row. U20s opening their season a week later than reserve grade and will only be playing 20 rounds rather than the full 24 rounds. It was sea-sawing contest before a classic prop forward try was scored by Manowski to level the game in the final 5 minutes. The U18 boys headed down the Melbourne for our outing against the Victorian team, who had re-joined the NSWRL competitions after playing in the QRL comps. They led early but found themselves down by 14 points midway through the second half. But a late surge saw them comeback putting on 3 tries in 10 minutes to finally win their second game of the season. Well the election is over with no change in government, and stadiums progressing as per plan now, the talk has returned to expansion. Clubs are currently negotiating a new perpetual licence where the NRL wants to add a clause that if a club falls over financially the NRL won't prop it up again and will relocate the licence. but this has quickly turned to another Super League style criteria debate as the ARLC grapple with how to manage expansion. The ARLC are currently putting together a strategic paper on the future of the game. In reality the only way forward is true expansion. And by that I mean 18 teams over 25 rounds. i don't buy into the talk that we don't have the talent for 18 teams. Today we have about 480 U20s players who are all trying to move up to the next level with about 240 players every year pushed out of the game. It would not be hard to keep 60+12 players in our game. With Brisbane 2 ready if either Ipswich or Redcliffe got promoted. While if we chose Perth you would need to plan for an U20s and NSW Cup squad to be established over a few years. Statistically it was a poor game. Completion dropped to 74% from 76% last week. Errors were again to 11 this week. We gave away 9 penalties compared to 3 last week. Souths Effective 1st tackle improved to a poor level of 37.7m from 25.2m last week. Our missed tackles were at a poor level of 33 missed tackles from 21 last week. Opposition offloads dropped to 17 from 9 last week. Looking at our left side defence - Graham-Burns-Walker-Sutton/Lowe (1-2-2-5) was dropped to 10 missed tackles from 8 last week. On the right side Gagai-Inglis-Reynolds-SBurgess/Turner (5-6-4-0) was dropped to 15 from 7 missed tackles last week. Ruck defence TBurgess/Knight-Cook-Tatola/Nicholls-Murray/SBurgess (2-1-2-2) was dropped to 7 from 4 missed tackles last week. Our go forward was steady at 1617m compared to 1628m last week. Tom Burgess, Sutton, Murray, Nicholls, Graham and Burns made 10+m per run. Sam Burgess, Murray, Tom Burgess, Burns, Gagai, Graham and Johnston making 100+m in the match. Defensively Cook was our best in the tackling raking up 38 tackles. Only Turner didn't miss a tackle.